The 35-3001 series is a compact sample draw detector assembly with a built-in pump that is powered from 24VDC. This unit features a NEMA 4X enclosure, making it dust, water and corrosion resistant. It also features a low flow alarm which warns of any obstructions or restrictions in the flow system. Combustibles, oxygen, and carbon dioxide versions are available with or without a 4-20 mA transmitter. H2S and CO versions both have 4-20mA outputs. 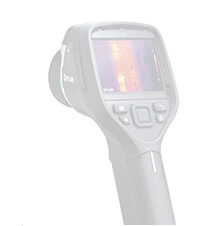 The 35-3001 is also available in many dual sensor configurations. 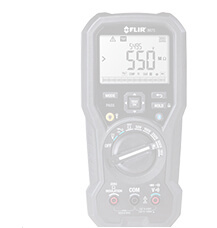 The 35-3001 is capable of single person calibrations and remote sampling at up to 5,000 ft. from a controller, and interfacing to any RKI or third party control system (utilizing a 4-20 mA feedback signal). Workplace safety is a top priority at RKI Industries. With a reputation as being a world leader in gas detection and sensor technology, the company invests heavily in their research and design team to develop the industry's leading workplace safety products. The GX-2009 Model Personal Four Gas Monitor utilizes advanced technology and efficient design. It is the world's smallest and lightest gas monitor. The GX-2009 Model Personal Four Gas Monitor is an obvious choice for many particularly hazardous applications. From personal monitoring in confined spaces to its use in fire services and construction, the portable monitor has been rated intrinsically safe. Its noticeable alarm functions and simultaneous detection of four separate gases help to ensure the safety of workers in potentially dangerous situations. The state of the art monitor can detect LEL, O2, H2S, and CO simultaneously and display the results on the large LCD display screen. Each of the miniature sensors are manufactured with the high quality control standards of RKI Instruments. The compact sensors utilize catalytic combustion, electrochemical, and galvanic sensor technology. The unit features dual audible alarm ports at 95 dB, and three bright LED lights for noticeable alerts. The Personal Four Gas Monitor also utilizes an ultra strong vibration alert designed to notify users of atmospheric conditions even when the device cannot be heard. When the monitor is in alarm mode, the backlight on the LCD display is turned on. The multi-faceted alarm system is designed to be noticeable in any given situation and is sure to notify the user and those nearby. The GX-2009 Model Personal Four Gas Monitor has many standard features including an incredible datalogging function. 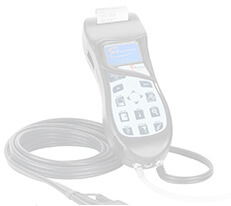 The datalogging software can store up to 100 calibration records and is compatible with many computer platforms. The log time can range from 10 to 300 hours and houses 8 alarm trends. The unit can also remind users of upcoming calibration and bump tests. With 2 glow in the dark, glove friendly buttons, users can easily operate the device on site. The unit comes standard with an alligator clip, NiMH batteries, a charging station with VAC power supply, and a product CD with datalogging software. The GX-2009 Model Personal Four Gas Monitor is the smallest and lightest personal gas monitor in the world. Weighing in at less than 5 ounces, the device fits easily in the palm of a hand and is easily portable. Additionally, the IP-67 water resistant and dustproof design contains an impact resistant over mold rubber body to protect the integrity of the device. The unit uses a set of 2 NiMH batteries with 20 hours of operation. Each GX-2009 Model Personal Four Gas Monitor comes standard with a 2 year warranty for materials and workmanship. Continuing in its legacy of durable and reliable gas detection and monitoring systems, RKI Instruments is proud to offer a new product in its popular Eagle portable gas detector series. The Eagle 2 can monitor up to 6 different gases and is equipped with several exclusive features that can only be found with the Eagle series. In addition, its large glove friendly push buttons and LCD screen ensure an ease of use when onsite. Rated intrinsically safe, the Eagle 2 is equipped with state of the art technologies that are not available with other competitive gas detectors and monitors. The Eagle 2 has a variety of available specialty sensors. 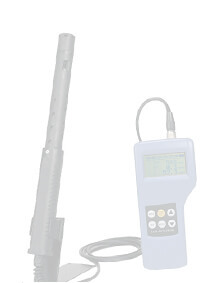 Workers can use a photoionization detector for low or high range VOC detection and Fence Electrode Technology for humidity and contamination resistance. An infrared sensor is available for Co2, % LEL CH4, % Volume CH4, % LEL HC, and % Volume HC. Thermal conductivity sensors are available for % Volume H2 and % Volume CH4. The unit is also compatible with the smart plug and play toxic sensors for the detection of NH3, AsH3, CI2, HCN, PH3, and SO2. With the wide variety of sensors and gas detection available, the Eagle 2 can be customized to meet almost all worksite gas detection needs. The monitor has a long internal pump that can draw samples for up to 125 feet. The pump features a low flow auto shut off and alarm. This allows operators to respond swiftly from a safe distance. The unit is multilingual with 5 different language preferences, and features an alkaline battery life of 18 hours or a NiMH life of 20 hours. To protect the integrity of the device and the configurations, the unit can be password protected. 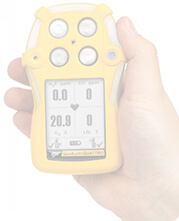 The Eagle 2 also has standard data logging capabilities for easy research, evaluation, and site monitoring. To reduce calibration costs and time, the unit features an automatic calibration option and a single gas calibration option. The Eagle 2 is heavily protected from environmental conditions by a weather proof, chemical resistant RFI/EMI coated high impact polycarbonate/PBT blend enclosure. The enclosure also renders the unit water and dust resistant. Because of the enclosure, the Eagle 2 can function in 2 inches of water without leakage. The portable and durable unit is lightweight at less than 4 pounds. Its dimensions are suitable for convenient carrying (9.5?L x 5.25?W x 5.875?H), and it features a conveniently placed durable top handle. The large easy to read display has a polyurethane overlay backlights on demand and when the alarm is activated. The 2 alarm channels are fully adjustable for the user and can be password protected. With a 95 dB buzzer and 4 high intensity LEDs, the alarm is sure not to be missed. The Eagle 2 is standard with a 2 year warranty for material and workmanship and a 1 year warranty for PID sensor. The GX-2009 is the smallest 4 gas portable monitor in the world. 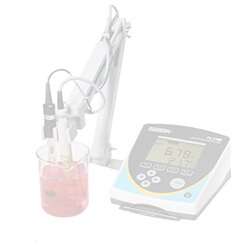 The RP-2009 is a compact, battery operated, motorized sample drawing pump which attaches to the GX-2009 to change it from diffusion operation to sample drawing operation. Together the model RP-2009 pump assembly and the GX-2009 gas monitor make a complete solution for confined space entry. The RP-2009 is housed in a rugged plastic case with a quick disconnect fitting for hose attachment, and it is provided with a hose and probe. Standard hose length is 10 feet, and lengths up to 30 feet are available. Then probe is equipped with an internal dust filter and clear body for easy viewing. The RP-2009 will operate for up to 5 hours on one AA battery. The pump quickly and firmly snaps over the sensor area of the GX-2009 gas monitor, and removes easily when sampling is completed. No tools are required. A push button ON/OFF switch is used to activate the RP-2009, and a green power light is illuminated when it is on. If a low flow condition occurs, from either a flow blockage or a low battery, an red flashing LED is activated and an audible alarm will sound. For added versatility, the RP-2009 pump assembly is also available for use with our model GX-2001 gas monitor.